Descending from a family of artists, Ibrahim El Dessouki was immensely influenced by his father, Fahmi El Dessouki and mother Atyat Sayed, who were well-known and established Egyptian expressionist painters and free-thinking intellectuals. While Dessouki’s painting oeuvre encompasses portraiture, landscape and still life, his subject of thought is focused on capturing his own unique perspective of the soul and essence of Egypt. 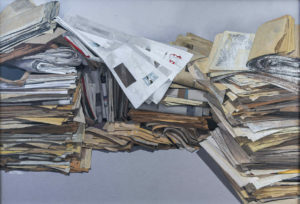 The artist’s ability to create subtle changes in textures through his unusual use of negative space and his agile manipulation of shadow and light characterize his painting style. In his works focusing on the female figure, Dessouki expresses his nostalgia for the women who strolled in his neighborhood as a child with their bountiful bodies hardly covered, graceful and elegant.